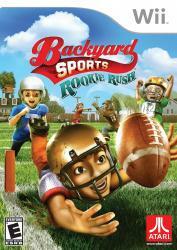 Backyard Sports: Rookie Rush allows players to control real-life NFL football players as recreated children, as the Backyard Football series is known for. It combines the action of real football with fictional aspects of gameplay the series is known for, like its power-ups and custom teams. This title features the previously created "Pick-up Games", "Season Mode", and "Tournament", and introduces two new styles of gameplay, "Story Mode" and "Mini-Games".